Not a lot of folks know about me, because most of my relatives are in France, where our breed is noted for herding sheep. My mom tells me that we are an ancient breed, dating back to the 1500's. I will be happy to guard anything that belongs to my people family, but I am not a violent or aggressive type by nature. I am pretty intelligent, if I do say so myself, so if you show me the boundaries and teach me the rules, I'll be a great companion --as a household pet or as a helper, like a guide dog. My short coat doesn't require a lot of maintenance. When fully grown, I am between 24.5 and 27.5 inches tall (62.2 to 69.8 centimeters) and I weigh between 66 and 85 pounds (29.7 to 38.3 kilograms). We have no Beauceron Breeders listed at this time. 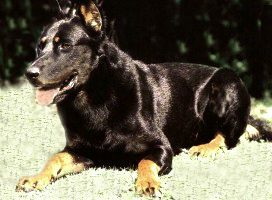 Click here to place your Beauceron Ad!